Inside the Haight Ashbury Free Medical Clinic in its earliest days. The clinic opened on June 7, 1967, and treated 250 patients that day. It's motto, then and now: "Health care is a right, not a privilege." Unlike many things from the 1967 "Summer of Love," the Haight Ashbury Free Clinic survived. The clinic, now part of a larger network, still operates out of a second-floor office overlooking Haight Street in San Francisco. A steep wooden staircase leads to a warren of small but airy rooms. One exam room still has a wall covered by a faded psychedelic mural, featuring a collage of famous rock stars, naked bodies and peace signs. The decor used to be even more colorful, according to lab manager Pam Olton. She has worked at the Free Clinic for more than 40 years. "Pink, aqua, Day-Glo orange ... all of these exam rooms were painted in those Day-Glo colors," she says. The colors helped the young patients feel welcome, Olton explains, easing their drug-induced paranoia or just reassuring them that the clinic was a safe and sympathetic space. In the summer of 1967, and for years after, the Free Clinic treated the countercultural denizens of the Haight-Ashbury neighborhood. They were often the patients that nobody else wanted. "You had a big flash mob of kids coming to this neighborhood from all over — from everywhere in America," Olton says. Most had no health insurance, and some were living in parks, on the street or sharing crowded apartments. "They're kids, they're dirty, they're a mess and they're addicted," Olton says. "But we have to take care of their medical needs first. And we have to be nonjudgmental. They're human beings — they're somebody's kid and we need to take care of them." Dr. David Smith was a young faculty member at the University of California, San Francisco when he started the free clinic 50 years ago. He's now 78 and still works in addiction medicine. "We were kind of the caregivers to the love generation," Smith says. At the beginning of 1967, he had one foot in the world of academic medicine and one foot in the burgeoning counterculture. He lived in the Haight and had experimented with drugs. "I had an LSD spiritual experience, and a vision that denial of health care to one segment of the population is a denial to all," Smith recalls. "So there was a transformation of me in that period, in '67, like what happened to so many young people. I just happened to have a medical skill when that transformation occurred." Dr. David Smith (second from left) helps a young woman by bandaging her feet as part of the clinic's street medicine in 1968. Smith knew that thousands of young adults would flood into San Francisco that summer, and he was worried about who would treat them and how these young people would be treated by people in mainstream medicine. "Some of us went to the city [health officials] and said, there's going to be a huge problem this summer, and we need what we called then 'a hippie clinic,' " Smith recalls. "And it was soundly rejected by the health department. They had no interest in this. They said, 'We don't want to take care of them. We want them to go away.' 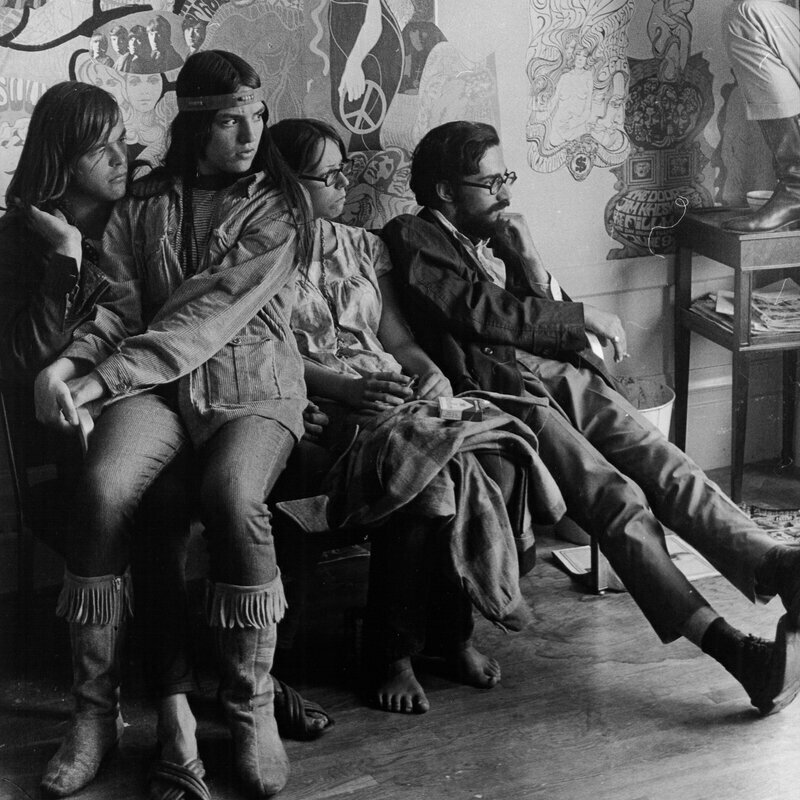 "
"It became the founding slogan of our Haight Ashbury Free Clinic," he says. The clinic opened on June 7, 1967, to a line of people stretching down the block. The team worked through the night and treated 250 people, Smith says. The next day, the staff treated 350 more. At that time, the staff was entirely volunteer — a mix of sympathetic doctors, nurses and students from the local medical and pharmacy schools. Keeping the clinic going was a struggle. Money for rent and supplies was in short supply. Police officers would frequently show up and search the rooms, looking for illicit drugs and underage runaways. But Smith was determined to keep the clinic open. If hippies hurt themselves, many mainstream doctors thought they got what they deserved. Sometimes hospitals turned them away. And when they got sick from taking illegal drugs, or overdosed, or became psychotic, they were often shamed, restrained or thrown in jail. The Free Clinic offered a safe space. "If you were taken to the Haight Ashbury Free Clinic, you would be put into a room ... with a talk-down guide and a lava lamp," he says. "You'd be examined by a physician to see if you needed medication to help you come down." After 1967, the clinic continued as a medical refuge and its compassionate approach endured through the harder drugs of the 1970s, and the AIDS epidemic of the 1980s. Eric Smith (no relation to the clinic's founder) remembers visiting the Free Clinic about 15 years ago. He was living on the streets of San Francisco and using heroin. He can't remember why he went there for care, but he does remember what it felt like to be there. "I went in there — there was a whole bunch of people hanging out. It was cool," Eric says. He remembers the staff and others asking, " 'How can we help you out?' 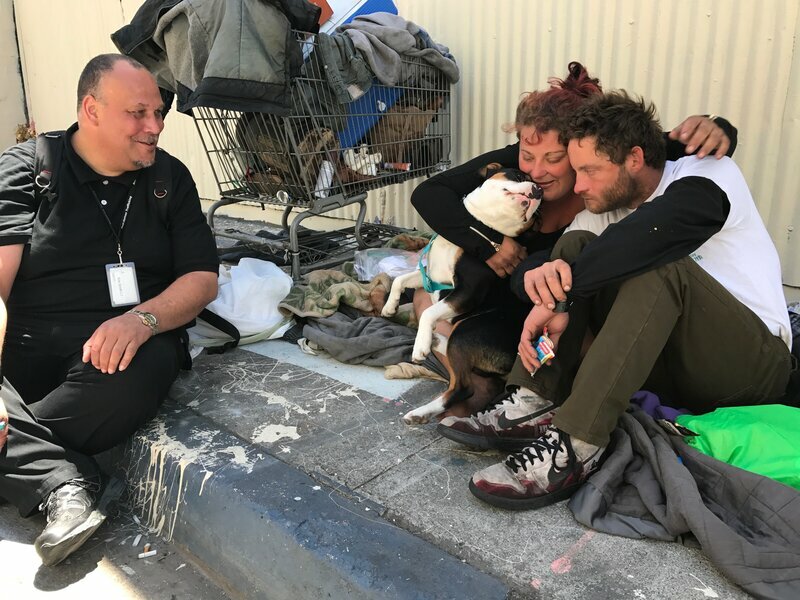 "
Eric Smith, left, talks to a homeless couple in San Francisco during neighborhood rounds. He's patient coordinator at the Haight-Ashbury Free Clinics, and wants to make sure they know they can get health care and addiction treatment there. "People were eating," he recalls. "Some girl asked if I was hungry. She brought me a vegetarian burrito. It was very welcoming, and I didn't feel nervous or ashamed being in there. You know? I felt like these are my people, they'll help me out. I can be honest with them. I think that carries on right now." Eric Smith eventually got off drugs, and for the last two years has worked for the clinic as a patient coordinator. When patients come to the clinic, Smith makes sure they are connected to the services they need — whether that's medical or dental care, therapy, detox or a drug recovery program. And he walks the neighborhoods of San Francisco, doing outreach. He brings naloxone for opioid overdoses and a CPR mask. He has a big backpack full of snacks to hand out, along with gloves, socks, condoms and toothbrushes. On the day I join him for his rounds, Eric stops by a row of tents on Folsom Street. Men gather around as he passes out supplies. "You guys know who I work with, right?" he asks as he hands out socks and granola bars. "So, you guys need any services at all? Is there anything you need?" On this particular day, none of the men are interested in visiting the clinic. Eric just smiles and moves on. No encounter is ever wasted, he tells me. "I have to build a trust and rapport with the individual, so they know — no matter what they tell me — that it's safe," he says. "You want the best for everybody, but you can't really push yourself too hard on them," he added. "You've got to meet them where they're at, and in their time they'll come around eventually, you hope." Erie Street is just one block from the Haight Ashbury Free Clinic's location in the Mission district. It's a long alleyway of sharp shadows and slants of sunlight. On the day we walk past, there is a tent at the far end, and a guy on a stepladder, spray-painting a mural on a large blank wall. "It's heartbreaking — I used to get high in this alley, too," Eric says. "I feel for these individuals." He spots some new faces. "Hey, guys," he booms, smiling and striding over. "You need any socks?" A man and a woman are cuddled together with just thin sleeping bags against the hard sidewalk. Nearby is a shopping cart stuffed with belongings and a cooler. A pit bull puppy flops across their legs. They sit up and happily accept everything Eric offers. "Hey, so you guys, you guys need any medical attention at all?" Eric asks. "Do you got Medi-Cal?" he asks, referring to the Medicaid program in California — the health insurance for low-income people. The young couple — Sean and Kat — are from Mendocino County, they tell us, and have been in San Francisco for only a month. They are trying to a quit a drug habit, and NPR agreed not to use their last names. They need advice, and Eric has plenty: They talk about places to get day-old pastries; charities that offer free breakfast or lunch; and places to shower. Eric points out the nearby clinic. They discuss getting the puppy fixed at the SPCA, which is also in the neighborhood. "You guys use?" Eric asks. "I mean I'm an old junkie, all right?" "We're working on quitting," Kat says. Kat tells Eric she used to slam, meaning she used to inject the drug. But after meeting Sean, she was able to stop that. He helped her "get off the needle." Eric jumps on this point: "Really? So you guys are together. And you're supporting one another, all right?" Giving up the needle is a small step, but a positive one. It's a little less harmful. Eric wants them to know he gets it: They're trying. "So, you guys, come and talk to me, OK?" he tells them. "Seriously, if you want help at all. I don't care if you don't want recovery or not, but just to know that there's someone out there. I used to get high right here in this alley, dude — back in the day." Today, the Haight Ashbury Free Clinics are part of an umbrella organization called HealthRIGHT 360. It's a large network of social service agencies tackling a variety of issues besides health care: domestic abuse; rehabilitation for ex-inmates; gay, lesbian and transgender health issues, and addiction. Consolidating with other agencies helped the Haight Ashbury Free Clinic survive. Seven years ago, in 2010, it was struggling financially. Some staffers had been caught embezzling, and the clinic couldn't afford the transition to electronic medical records — a requirement of the Affordable Care Act. In 2011, the Free Clinic joined forces with Walden House, a nearby addiction recovery center. Other nonprofits soon joined as well, and HealthRIGHT 360 became the umbrella brand, allowing the smaller agencies to pool resources for administration, electronic records and fundraising. Dr. David Smith, who started it all, applauds the decision to consolidate with other nonprofits. But he does miss the intimacy of those early days, he says, when volunteers from the neighborhood worked at the clinic. When money got tight back then, they held benefit concerts, featuring local bands — like Big Brother and the Holding Company, during the time Janis Joplin was the lead singer. After 1967, free clinics opened in Seattle, Los Angeles and Berkeley. By the end of the 1960s, the U.S. had dozens of free clinics — a third of them in California. This story is part of a NPR's reporting partnership with KQED and Kaiser Health News.